The crazy-warm weather we've enjoyed in Delaware this week has me thinking of summer days, the beach and a quilled jewelry tutorial I've been meaning to post here ever since the paper crafting site Folding Trees closed its doors. This was actually my very first quilling tutorial and was shared there as a guest post, so I'm happy to be able to give it a homecoming of sorts here on ATP. It was the first of many quilled jewelry tutorials I've written since launching the blog... this month is its seventh anniversary! 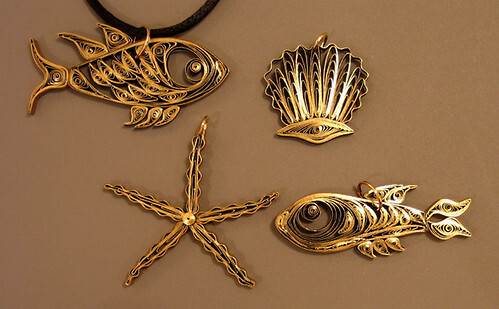 Optional: I usually don't find it necessary to use a protective coating on paper pendants, but in a hot, humid climate you may want to apply a spray or brush-on matte fixative. Liquitex Matte Varnish is a good one. Additional quilling and paper craft supplies can be found in my Amazon shop. 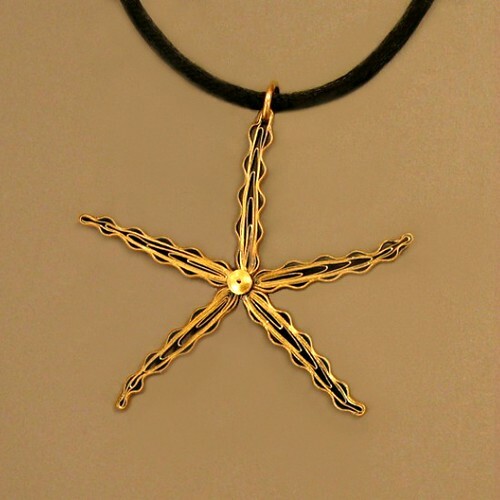 The starfish arms are called wheat ears in quill-speak. They are made with a simple folding technique. You'll make five wheat ears with six loops each. 1. 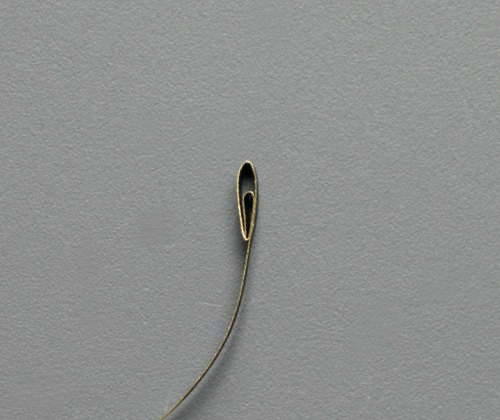 Begin a wheat ear by making a ¼ inch fold at one end of a 10 inch (approximate) strip. 2. Loop the strip completely around the fold; apply glue at the bottom of the loop to anchor the strip in place. Continue to loop the paper, spacing the loops evenly. It isn't necessary to glue each one. Each should be slightly larger (taller) than the previous loop. Gently shape the loops as you go to form a column. 3. Glue end and trim excess paper. Gluing tip: When it comes to glue and quilling paper, less is more. I like to put a small dollop of glue on a plastic lid and dip from it with a toothpick or pin - this helps to control the amount. 4. Glue two 14-inch strips, one on top of the other, to create a double thickness. Wipe away any excess glue with a damp cloth while the glue is still wet. When the glue has dried completely, run the strip through a paper crimper. Cut strip into 2½-inch lengths. 5. Apply glue to one side of a crimped length and press it gently in place around a wheat ear. Trim excess. Repeat for each wheat ear. 6. Arrange wheat ears in a star shape and glue them together at center point. Bend tips slightly for a natural look. 7. Make the center coil: Cut a 4-inch strip of quilling paper in half lengthwise. Insert one end of the strip in quilling tool slot. Turn the tool with one hand while guiding the strip with the other. 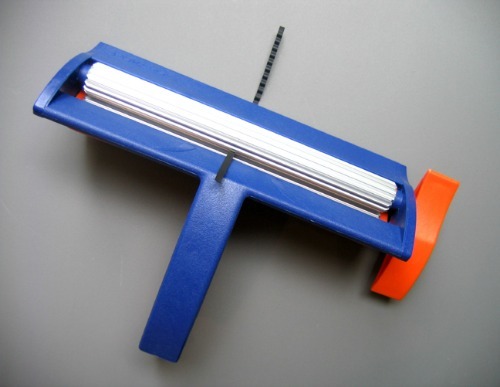 When the paper is fully wound, apply a bit of glue to the end, press in place, and slide coil off tool. 8. 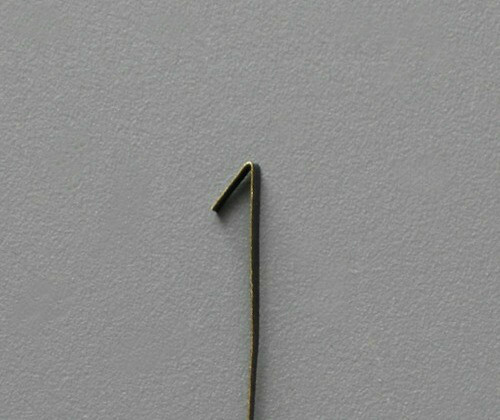 Gently press against underside of the tight coil with the ball of a glass-head pin. Apply a small amount glue inside the dome to preserve the shape, then glue it to the center of the starfish. 9. Reinforce pendant strength: Dot glue on the back at the center join spot. Allow glue to dry completely, preferably overnight. 10. 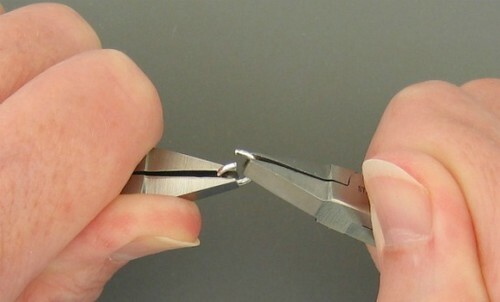 Attach jump ring: To open jump ring, grasp each side close to the split with pliers and twist gently. Slip ring through the end of one starfish arm and reverse the twisting motion to close. 11. Slide necklace cording or a chain through jump ring. Finis! Something new to wear today. 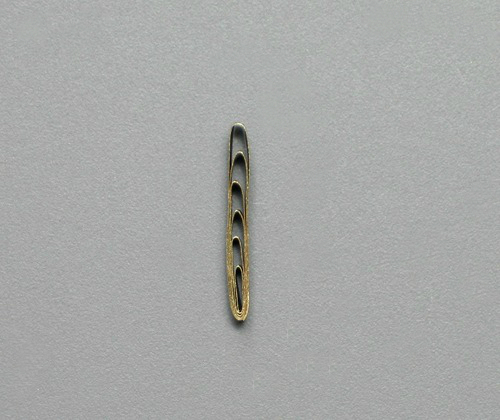 Tip: If you don't have access to metallic-edge quilling paper, plain black strips can be edged with a gold leafing pen. Another option is to press the completed quilling against a metallic ink pad, such as Galaxy Gold by Brilliance. 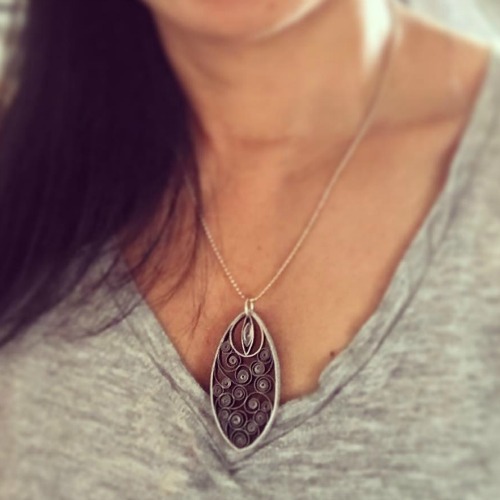 One more thing... Richela Fabian Morgan surprised me earlier in the week when she posted this photo of herself wearing a silver-edge black paper pendant I made for her a few years ago. (You might recall Richela's name from this grocery bag tote bag she designed for the All Things Paper book and her own series of Tape It & Make It duct tape books.) She said she tries not to wear it too often because she's really hard on her jewelry so I told her my all-time favorite paper jewelry tip... Last thing on, first thing off! Thanks Joan, Suzana and cate! I'm glad you like the necklace idea. I'm working on a book of quilled wearable designs so stay tuned for more. Oh, this is so beautiful! So delicate!